The Citadel at Brouage has a rather intriguing history. Constructed in 1555 for Jacques de Pons, Earl of Hiers, the citadel was then known as "Jacopolis" At the time the citadel was an ocean port in, what was said to be, one of the most beautiful harbours in all of France. The port prospered. Then during the reign of Henry III (1573-1575), the city, now boasting a population of some 4000, was renamed Brouage. After Louis XIII (1610-1643) became King of France, the role of the citadel began to twist. One Cardinal Richelieu became the governor of the city. Under his control it became a Catholic base used mainly to control the Huguenot region. Then, Marshal Vauban, during the reign of King Louis XIV (1643-1715), saw the strategic potential of Brouage and transformed it into a military stronghold. . It was during the French Revolution (1789-1799) that the colourful history of Brouage took its darkest twist. It became a prison for unsubmissive clergy members. One shutters to think what went one behind its walls during those dark days. Interestingly, while all this history was rolling by, the marshlands surrounding the city grew and grew until the port city became landlocked. Unable to retain its strategic importance it fell into disuse. These days the Ramparts of Brouage are quite a tourist attraction. 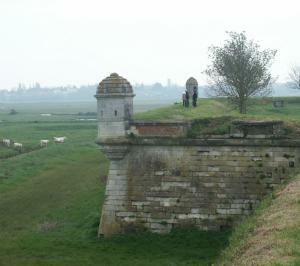 Many like to "walk the ramparts". On 17 October 1955, France issued a lovely set of nine stamps highlighting some of the sites and monuments of France. One of the stamps in the set focuses on the Ramparts of Brouage. This stamp was designed and engraved by Albert Decaris. This stamp truly amazes me. Basically what we are looking at here is... a wall! Yet i love it. That to me is a sign of tremendous skill. Making a wall exciting. But Decaris does just that. 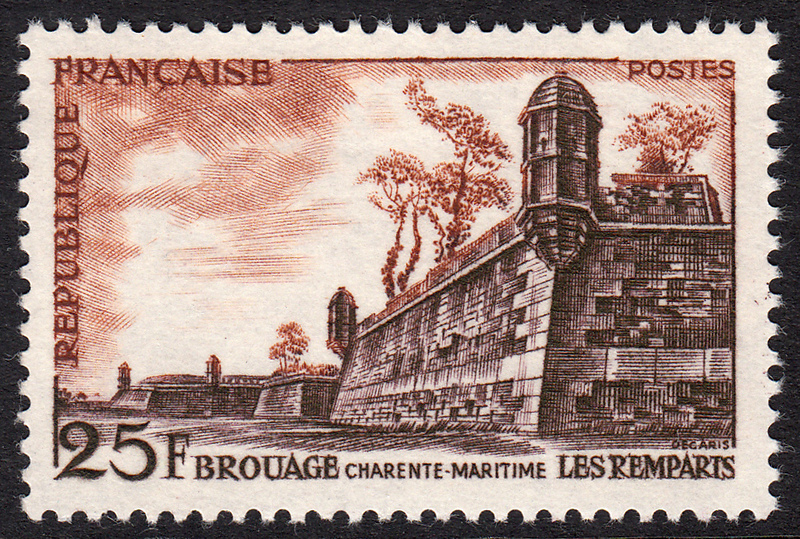 To me, the combination of the sepia tones, the gorgeous textures of the walls, and the lovely trees standing proudly atop the ramparts, makes this stamp a visual feast.